– I wrote a Video tutorial compiling tips from 4 reference books about meaningful cinematography and editing tecniques for low-budget short films and video. It focuses on the concepts of treatment (that is, the subjective/philosophical/moral/ political viewpoint adopted by the filmmamker) of a subject (the raw events of the plot, regardless of the subjective googles chosen by the filmmakers) and establising film mood, and the technical choices that contribute to this. – Then I used the technical knowledge learnt while writing this tutorial to make new and improved edits of ‘Ghost House’ and ‘Disciplinary Institutions’. The new versions of both videos also incorporate newly shot footage, and the editing is designed to trap the viewer inside a subjective experience. The ‘Disciplinary Institutions’ video was shown at a commercial gallery in London and the ‘Ghost House’ video will be screened at Optica festival (Madrid, 16-18 September). I also made a short video of Woodlawn House, an empty mansion with ornamented decor, with an mood inspired by ‘Last year in Marienbad’. This is a work in progress because I do not have enough footage yet, and need to find similar places to make a longer composite video (both ‘Ghost House’ and ‘Disciplinary Institutions’ are composite containing footage from several actual places with the same look and concept). – For the photography side of my practice, I wrote a Technical Tutorial about Digital Photograph Post-Processing Workflow (in Photoshop) compiling tips from 2 reference books, then applied the techniques I learned to enhance my photographs (the photographs were shot in Unit 1 but post-processed in Unit 2). Practical examples of processing for the photographs requiring the most post-processing are detailed on my blog, and the whole series of photographs are visible on my website (Ghost House and Disciplinary Institutions). I also experimented with HDR (High Dynamic Range) processing even though I decided in the end to use a different, more creatively appropriate processing. – Before our show, I wrote a Round up of other MA Digital Art/Media degree shows containing critics’ opinions about the way they were presented to try and find useful tips about what to do and the common mistakes to avoid in our own show. 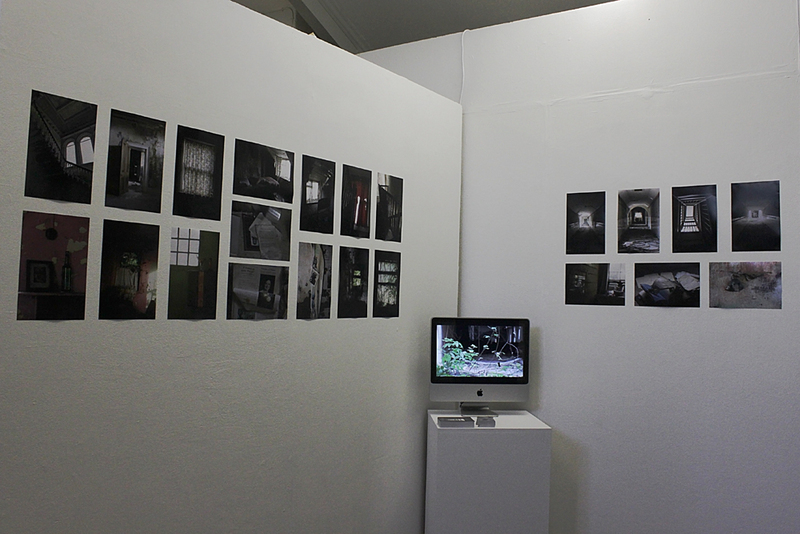 Photographs of my space at the MA Digital Art 2011 show are shown on the blog. The Ghost House and Disciplinary Institutions videos loop one after the other on an Imac screen, and I have curated 7 Disciplinary Institutions and 15 Ghost House photographs on the walls. – Finally I made a website to showcase my work in a more organised, succint and professional manner. I also made most of the MADA show website (with some help from Jonathan). – An analysis of my current practice can be seen in the first part of my Written paper. – In depth articles on my blog contextualise my photography practice within the subjective documentary genre and my video practice within experimental film and traditional video-art, especially the genre of ‘psychodrama’. Robert Polidori and explain in what measure I share his concerns and process. comments judged the presentation ‘clear’ despite my limited participation. 3. Summarise your overall progress and formulate a constructive plan for continuing Personal and Professional Development. – Future plans for my art practice are detailed in the second part of my Written paper. – For professional development, I applied to Phds or equivalent (at UAL, Brighton University and Le Fresnoy). Although I was invited to 2 interviews (UAL and Le Fesnoy), I was not accepted anywhere, but the application process gave me the opportunity to research cognitive film theory (for UAL). – Developing a project proposal for Le Fresnoy led me to contextualise my practice within digital moving image. Researching artists who use digital technologies (such as sensors and randomness-generating algorithm) together with moving image and share my themes of predilection, led me to think about how I could go about using more cutting-edge digital techniques in future work while still focusing on my non-technology-related themes. This is one of my future plan detailed in my Written paper. – The second possibility detailed in my Written paper is to make a narrative short film where the cinematic mood would be carefully crafted to reflect the character’s subjective experience. This is also a project originally developped for my Fresnoy application, that I now would like to pursue independently. I started working on the script. – My third and last plan for my personal art practice is simply to continue my abandoned buildings photography and video practice with both ongoing projects and new ones (abandoned cinemas and theatres). 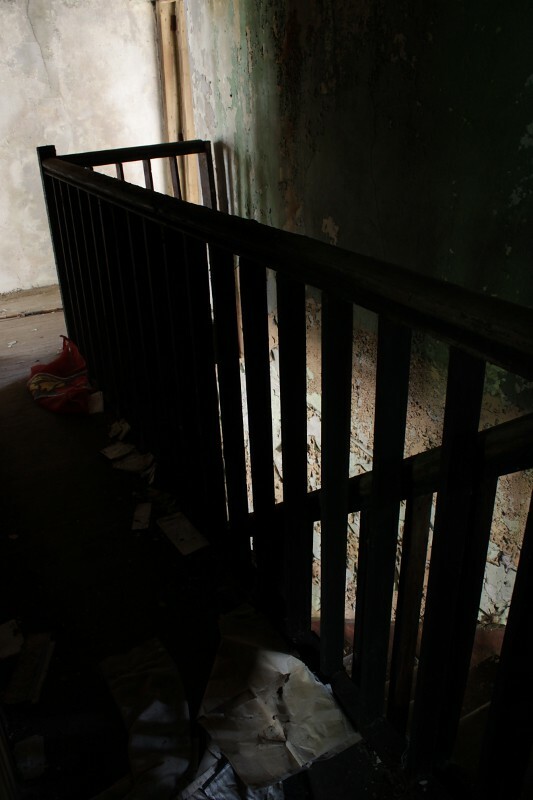 The practical possibility for exploring abandoned buildings is limited in the UK, that is why I want to take my practice in new directions as well, so as not to be prevented from producing work by external circumstances I have no control on (inaccesible buildings). Apart from my personal art practice, I also started thinking about how I could use the skills gained in this MA commercially. My two goals when I started this MA were to develop my art practice, but also to try and gain useful skills to get a better day-job. I am not sure yet what type of job would be a good match, but I explored a few possibilities. – Teaching/art workshops/adult education: I wrote a 10 000 word Video tutorial compiling tips from 4 reference books, 1550 word Photography tutorial explaining shooting tips, general principle of exposure and specialised tips for architectural photography compiled from two reference books and a 2500 word tutorial about Digital Photograph Post-Processing Workflow (in Photoshop). I wrote these 3 documents as structured course-type pdfs because I wanted to train myself to write structured teaching material usable by other people. – I added to my website a section of documentary and architectural photography and video in order to showcase a possible commercial development for my practice (shooting promotional for interior design, publications, architects, monuments and such). This section is still incomplete and only contains a few pictures. 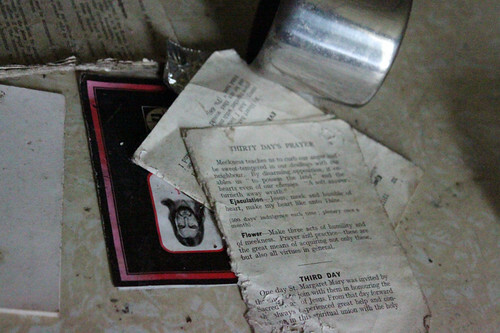 My documentary photographs were used in a blog about outsider art environments. This MA helped me develop my practice in two main ways: contextualising my practice within relevant traditions of contemporary art, and thinking deeper about the link between technical choices and audience perception, how to use specific techniques and effects to manipulate the audience’s reaction to the artwork. The main issue I had about my photography practice was that, while it is formally documentary because I do not stage what I photograph, I was not concerned about the ethical issues that typically preoccupy documentary photographers. On the contrary, ambiguity was my main underlying interest, and I favoured distinctive aesthetics rather than clarity of representation. I discovered a ‘niche’ genre of photography: ‘subjective documentary’, that is, unstaged photographs that can technically be considered documentary pictures, but give more insight into the photographer’s mindset than they provide reliable information about the photographed subject. I feel especially close to various American photographers who, since the 1970s, take pictures of backward rural areas, bland suburban settings or urban decay with often an ironic or morally ambiguous subtext (Stephen Shore Robert Polidori, William Eggleston, Alec Soth). Their work share a cinematic look, with dramatic lighting and almost ‘technicolor’ colours that create an ambiguous contrast with the unstaged nature of the scene. I studied the technical aspects of photography, especially achieving good exposure in low light, and digital post-processing, in order to achieve this desired look more efficiently in my own work. Particularly, Robert Polidori explains in an interview how the visual style of his images is crafted to emotionally manipulate the viewer: the apparently straightforward documentary style hides the emotional manipulation aimed at the viewer, making it all the more efficient that it is surreptitious. This process is very close to what I do in my Ghost House and Disciplinary Institutions series, where the real subject is not the architectural documentation of the buildings, but my underlying interest in guilt, outsiderness and the fear of abandonment. Because my original influences in moving image were from cinema, my research paper studied from three reference films how all the technical elements of moving image may work together to represent on screen the subjective mental experience of a character with an ambiguous degree of truth. After, I continued the research in reference technical books in order to learn more general techniques transferable to my non narrative video-art. I learned the central concept of ‘cinematic mood’, that is, using audio-visual stimuli (such as cinematography, the pace of editing, sound design) rather than narrative techniques to cue the audience about emotions and identification. I used these techniques in my videos in order to trap the viewer inside a subjective experience. In Ghost House, I aimed to keep a very fluid rhythm to give a sense of geographical continuity even though the video was shot at three different houses, to give the impression that a ghost was moving through the house and we were seeing the world through its eyes. In Disciplinary Institutions, I kept a steady rhythm and directional continuity in long corridor tracking shots that progressively get darker, to convey the feeling of powerlessness and crushing fate experienced by the inmates. Critic A.L. Rees coins the term ‘psychodrama’ to describe a genre of experimental film starting in the 1940s that deal with inner life and conflict. In his reference book ‘Visionary Film: The American Avant-Garde’, P. Adams Sitney calls ‘trance films’ a similar tradition of films depicting dreams or inner visions. My own moving image work is closest to the revival of psychodrama and trance-films from the 1990s until now, when artists like Stan Douglas or Doug Aitken applied the aesthetic conventions of horror, noir or other genre movies to either documentary footage, or staged scenes shot in natural settings, and mixed dream sequences with documentary footage, in order to talk about social concerns without formally resorting to the traditional documentary style. I like the aura of moral and philosophical ambiguity that blurring the lines of documentary and fiction gives to a moving image work. 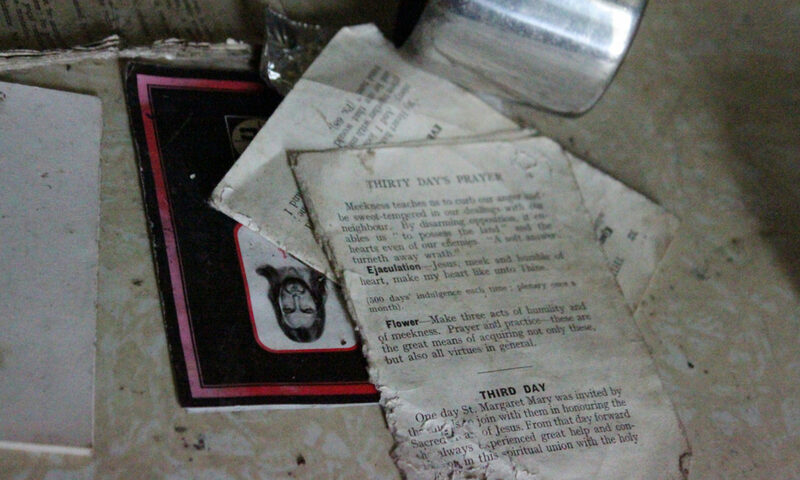 The possibility to explore abandoned buildings in the UK is limited, because security is tighter than in Ireland, and the available buildings are mostly stripped down and void of artefacts, which make them visually repetitive quickly. I have however identified an old orphanage whose ornamented décor would make a good fit to use in a composite video with my footage from Woodlawn House, a few asylums, and a few abandoned cinemas that would be a new project. I have applied for permission to shoot at the orphanage and two cinemas, but the negotiations are slow and the success rate low. Therefore I want to continue exploring abandoned buildings as an ongoing background project, but also develop my practice in two possible new directions. Writing my research paper gave me the desire to move away from purely visual video-art and experiment with narrative in a short film where the cinematic mood would be carefully crafted to reflect the character’s subjective experience. I have started writing a short script about a man who, feeling crushed by a life he judges meaningless, seizes the opportunity to escape. But soon his own guilt at having neglected what he considers his responsibilities causes him to throw his one chance away, and self-destruct. I would probably shot in HD video, with natural ‘noir’ lighting, to achieve an atmospheric look at low cost. Many independent filmmakers self produce their first short film: I think the best way for me to achieve this would be to join an independent filmmakers’ group for mutual support, mentoring and skill-pooling. Another direction for development would be to use digital technology to go beyond traditional video installation by enhancing the feeling of immersion, or by making the images react to the viewer. I am especially interested in using random generator algorithms to simulate the often erratic and irrational way human beings make decisions and choices. To make an immersive audio-visual installation that reacts to the viewer, sensors could respond to movements and vocal triggers from the viewer, and control the sound design and displayed visuals accordingly. The environment could confront the viewer with feelings they may usually prefer to ignore by using audio-visual stimuli that simulate feelings of spatio-temporal distortion, claustrophobia and disorientation, or trigger instinctive emotional responses. An assessment criteria for Unit 2 of the MA is showing we pursued strategies for professional development. I’ve applied to 3 Phd or equivalent (at UAL, Brighton University and Le Fresnoy in France) and, though I did not get into any of them, the application process gave me the opportunity to do some research that eventually enriched my critical awareness, and to gain experience pitching my ideas at interviews. First, I applied to a Phd at UAL with the subject below. I made it to the interview stage, and the interviewers seemed interested in my proposal, especially when I explained that, as far as I knew from researching my MA research paper, there was currently no specialised literature on the subject (such as a dedicated book), but rather little bits of knowledge about it were scattered in general books about a particular director or film. I explained that the closest to a specialised book I found was ‘Film: a sound Art’ by Michel Chion which compiled the meaningful use of sound design to express abstract ideas or feelings, but no equivalent book existed for the visual part of moving image as far as I knew, and that’s what I would like to do as my thesis. The interviewers however expressed concerns that my subject matter, dealing with moods and potentially dark psychological states, could be daunting as a Phd subject, a Phd being in itself a stressful enterprise. In final, I did not get in because UAL was unable to assemble a supervision team. Using moving image to represent subjective experiences that trigger emotional responses in the viewer. Research how a viewer perceives, is influenced by and reacts to moving image works, and which parameters of moving image, such as particular audio-visual characteristics, carry emotional meaning and may trigger specific reactions in the viewer. Then use these theoretical findings to create a new body of moving image work (as short film and/or video art) especially designed to invite the viewer to experience the subjective point of view depicted on screen on an emotional or subconscious level, rather than solely on an intellectual and critical level. In particular, I am interested in making work that confront the viewer with feelings they may usually prefer to ignore such as confusion, delusion, fear or alienation. This may be done by using moving image to simulate feelings of spatio-temporal distortion, claustrophobia and disorientation. Research how to use moving image to represent subjective perception and affect the viewer emotionally. Create a body of work (short film and/or video art) making practical use of those theoretical findings. Survey creative choices of film makers/video artists who focus heavily on creating a particular mood in their work. Look for recurring technical tricks. Research the psychological mechanism of audience response to moving image. Look for possible correlation between the creative choices of artists and the physical parameters that trigger specific responses in the audience. Deduct meaningful aesthetic choices that may help eliciting a specific response in the audience. Decide which type of moving image (short film/video art, narrative/purely visual, fiction/documentary) is most promising to explore particular subjective experiences. Use meaningful aesthetic choices within moving image works in order to convey these subjective experiences more effectively to the audience. Brighton University had AHRC funding only for a Phd in photography, so I modified my UAL proposal to include photography. They welcomed Phds dealing with the link between photography and moving image, and photography and space, so the subject was a good fit, even though I had a concern that dealing with 2 media may be a bit much for a 3 year project. It was a very competitive award with one funded place only, and I did not get shortlisted. I could have put the project forward for self funded study, and I could possibly have been shortlisted for a non AHRC Phd, but I chose not to pursue this because, should I go down the route of a self-funded part-time Phd, I would rather go back to my original UAL proposal with moving image only. The only reason I had modified it to include photography too was to qualify for the AHRC award. There are two reasons I would rather do a moving image Phd. First, I think working in two media would make the project too ambitious for 3 years (or 5 years part-time). And, more importantly, when I did some critical research during the MA, I found out that my practice of photography was quite intuitive and that, while I benefited from purely technical study to improve my photographic practice, I did not feel that critical study changed or deepened my relationship with the medium. On the other hand, I found that critical and theoretical study (particularly my research paper) improved a lot my understanding of moving image, and dramatically changed the way I used the medium. So a Phd in moving image would be more useful, since it would lead me to do deeper theoretical research. Subjective Space in Photography and Moving Image. During my MA, I found out that my own interest in the representation of space as psychologically charged was shared by many practitioners in photography and moving image. Yet, critical books dealing with the subject of space or place usually consider them under the documentary or political angle. Anthony Vidler is the only scholar linking space perception and mental states, and his critical work is mostly about architecture, not the representation of space in lens-based artworks. I would like to correlate knowledge from psychology about audience response to lens-based images with aesthetic choices made by lens-based artists with strong interest in the subjective perception of space, in order to find out whether their aesthetic choices are arbitrary or scientifically designed to trigger a deep involvement of the audience on a subjective and intuitive level. I would then apply these techniques found to be meaningful to my own practice in the hope that it deepens the viewer’s emotional involvement and intuitive interaction with my lens-based work. Research how subjective space is presented in moving image. Research how subjective space is presented in photography. Create a body of work in photography and moving image (short film and/or video art) making practical use of those theoretical findings. Research the psychological mechanism of audience response to photography. Survey creative choices of film makers/video artists who focus heavily on creating a cinematic mood in their work. Look for recurring technical tricks. Survey creative choices of film photographer who focus heavily on creating a moody atmosphere in their work. Look for recurring technical tricks. Look for possible correlation between the creative choices of artists and the physical parameters that trigger intuitive or emotional responses in the audience. Use meaningful aesthetic choices within my own lens-based work in order to convey a subjective experience more effectively to the audience. The last thing I applied to was Le Fresnoy Studio National des Arts Contemporains in Lille (France). It is not a Phd, but rather a 2 year programme of professional and practical training one does after a Master. Students have access to a professional budget to produce 2 works, in lens based media or installation the first year, and in digital art the second year. I got to the interview stage but was not selected. In the first year, I would like to make my first narrative short film. Researching my paper gave me the desire to move away from purely visual video-art and experiment with narrative in order for the images to depict more explicitly a subjective viewpoint. I have started writing a short script about a man who, feeling crushed by a life he judges meaningless, seizes the opportunity to escape. But soon his own guilt at having neglected what he considers his responsibilities causes him to throw his one chance away, and self-destruct. I am aiming to keep the number of characters down, and to represent the scenes visually in my mind as I write them, in order to ensure that they can be filmed in natural locations with ‘noir’ lighting, so that the cost is kept minimal and the project is realistic in a school context (and with a school budget). I am aware the story is heavily influenced by David Lynch, but this is my first attempt at writing an original story, and I am very open to it changing as I gain experience and knowledge, both by trial and error and through mentoring by experienced artists. Also, the downfall of Lynch’s characters is usually triggered by an external event (in both Lost Highway and Mulholland Drive, the main character goes criminal because their lover has been unfaithful) whereas I would like to tell the story of a character driven to self-destruction solely by their own feelings of guilt and repression. In the second year, I would like to create an immersive audio-visual installation, similar to Eija-Liisa Ahtila’s Talo, but as an environment that reacts to the viewer’s actions to increase their feeling of identification and involvement, rather than as a purely descriptive installation. This could be done using sensors that would command the sound design and the displayed visuals to change when the viewer moves or looks in another direction. In particular, I would like to simulate an environment that would confront the viewer with feelings they may usually prefer to ignore such as confusion, delusion, fear or alienation. This may be done by using audio-visual stimuli that simulate feelings of spatio-temporal distortion, claustrophobia and disorientation, or trigger instinctive emotional responses. 1st year: narrative short film where the cinematic mood is carefully crafted to reflect the character’s subjective experience in the tradition of David Lynch. I have a draft in-progress story of a character driven to self-destruction solely by their own feelings of guilt and repression, not by an external trigger. I would probably shot in HD video, with natural ‘noir’ lighting, to achieve an atmospheric look at low cost. 2nd year: immersive audio-visual installation that reacts to the viewer’s actions. Sensors could respond to movements and vocal triggers from the viewer, and control the sound design and displayed visuals accordingly. The environment could confront the viewer with feelings they may usually prefer to ignore by using audio-visual stimuli that simulate feelings of spatio-temporal distortion, claustrophobia and disorientation, or trigger instinctive emotional responses. I felt the interview was more awkward than at UAL, even though I can’t really pinpoint why. At UAL, even though I was not selected, I felt that the interviewers really engaged in a dialogue with me, understood my process, and that the concerns they voiced were pertinent. At Le Fresnoy, I had the subjective impression that communication with the panel of interviewers was not really on the same level, even though the interview flowed smoothly and politely with questions and answers. It is a purely subjective impression, but I felt the interviewers seemed a bit puzzled that I was interested in mood and communication with the audience on an intuitive or subjective level, rather than in a ‘theme’ or a ‘message’. I felt they did not quite know how to handle my subject and therefore struggled to engage in a dialogue with me. One mistake I made entirely by myself (and realised afterwards) is that I had a tendency to anticipate possible criticism made to me, and address them in advance. My biggest worry was that my first year project was heavily influenced by David Lynch’s ‘Mulholland Drive’ and Ingmar Bergman’s ‘Persona’, and I stated this pre-emptively, so as not to look like a vain young artist who is unaware she is reinventing the wheel! The interviewers did not seem to understand why I was concerned about my project being influenced by someone else’s work. Indeed, when I watched work from graduating students at the degree show, someone made a short film very similar in look and atmosphere to the recent wave of Spanish psychological horror movies, and obviously, the school judged it to be a perfectly acceptable project since they produced it. So, on this point, I was simply too critical about myself. Next time, I will know not to anticipate criticism, but rather wait for them to come. In any case, the interviewers could not see the link between my story pitch and ‘Mulholland Drive’ or ‘Persona’, but instead, one interviewer said it was very similar to ‘Blue Angel’ with Marlene Dietrich. I was a bit taken aback because, although ‘Blue Angel’ is a film I love, I could not see a relation apart from a very superficial surface plot. For me, fair enough the plot was similar (a love obsession that ends badly), but the treatment was totally different: ‘Blue Angel’ was a dark social satire whereas my script was a psychological thriller. Sadly, the concept of ‘plot’ vs. ‘treatment’ only came to my mind after the interview! If I had thought of explaining things that way immediately, I would have made myself clearer. Instead, I tried to explain why I did not see the two stories as related, but, because it was a question that had never crossed my mind before, I was not very clear about it. I said that, while in ‘Blue Angel’, the object of love (Marlene) remains an object of obsession completely exterior to the hero, in my pitch, the object of love is a projection of the hero’s thwarted ambitions, an embodiment of what he wishes he could be. Thinking backwards on it, I think the main reason I was unable to defend my story in a more articulate way is that I was very shy and insecure about it. I have never written an original story before, and had not talked about it to anyone, so pitching it in front of the panel was the first time I ever presented it to other people. And I am aware I lacked some guts and presented it in a vague way on purpose, in order to tone down the more controversial elements in it. Next time I pitch it, I should make it clear that the story deals with the theme of the double, and that there is a deliberate ambiguity as to whether the object of love is a second character or a projection of the hero’s idealised self. The story as I see it can be read both as a tragic love story, or a psychological battle inside the hero’s mind between his sense of duty to social norms and his ambitions and desires (the supergo vs. the Id). Both interpretations are acceptable and it is for the viewer to choose (or not). I did not have the guts to make this clear because the script is still a draft and I am still insecure about it, so I toned it down on purpose, inviting misunderstanding from the interviewers. Next time, I’ll just go for it because it’s better to have your pitch rejected because the panel does not like it, rather than because they do not understand it. Another point of slight contention during the interview was that I started explaining that I would probably shoot the film in HD video because it offered the best compromise between a cinematic look and a low budget. The interviewer waved me off, saying it was ‘just techniques’ and he was not interested in it, just in my concept. I don’t consider my talking about technique a mistake: I did it not because I am obsessed with pure form over concept, but to show that I had done my homework properly, that I had read books about how to produce your first short film (‘Making short films’ by Clifford Thurlow) and researched the budget constraints, and the best practical solution to obtain a professional look with a low budget. I wanted to come across as a responsible, realistic person rather than as a dreamer with unrealistic expectations of infinite budget. I still believe this approach was not a mistake and that it may pay off should I pitch my project again for private funding or a grant. I think the reason the interviewers reacted badly to it was purely because of a culture shock: the school gets huge funding from the French government and students are given professional budgets on a scale that you do not see in any other school, so they are not used to worry about money, and they did not understand that it was what I was doing. However, the interview was a very valuable experience, the first time I pitched a potential narrative work. Writing my research paper gave me the desire to explore narrative, and I would like to continue working on my script after the MA and try and find a way to shoot it as an independent filmmaker. Many people self produce their first short film and that’s something I’m considering for next year, should I find a way to join an independent filmmakers’ group or coop for mutual support and possibly mentoring. For the ‘Pecha kucha’ group tutorial presentation, I’m going to put 20 still images with a short sentence of text that would not take me more than 20 seconds to say verbally should I have the possibility to present in person via powerpoint. I just find this is a clearer and more straightforward way to present than to use video to display 20 still frames, with either a voice over (with my French accent on youtube quality) or subtitles that would either be superimposed on the image and obscure it or rolled down at the bottom at the speed that may not be comfortable for all viewers. 1) My project explores the subjective perception of space via the media of photography and video. My research led me to study very different influences. 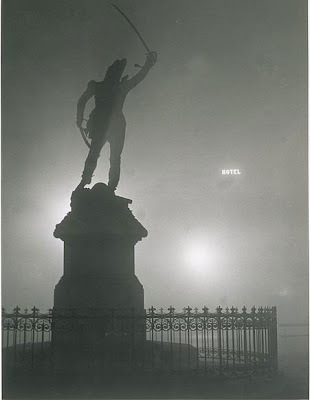 2) The Surrealists used photography to hunt for the ‘everyday marvellous’ in the city. They believed that nothing was stranger than reality. 3) A long tradition of American photographers do ‘subjective documentary’, that is, documentary photography that tells more about the photographer’s mindset than the subject. 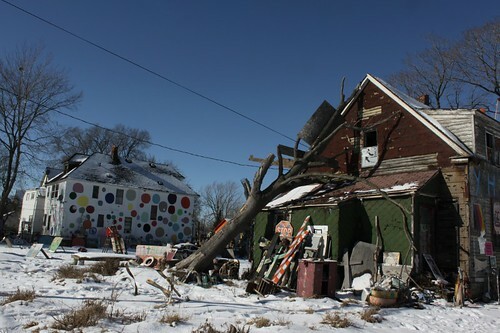 They often photograph backward rural areas or urban decay. 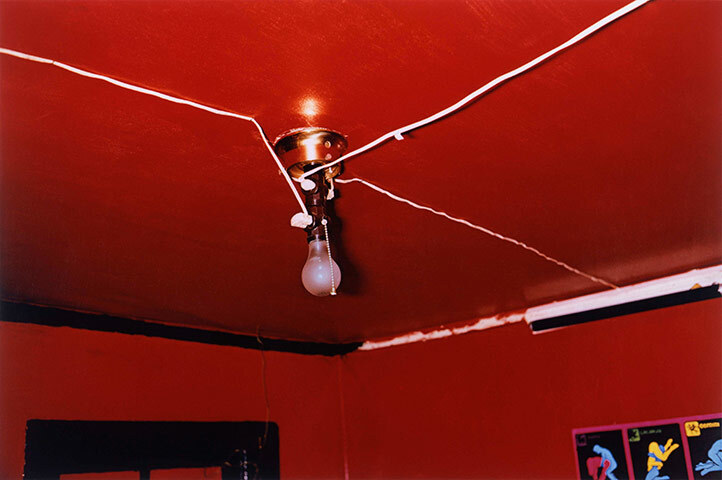 4) I’m especially influenced by Robert Polidori who photographs ‘interiors as metaphors for state of being’. He started with abandoned buildings like me, then branched out to interiors that mirror a country’s view of itself, such as Versailles or Cuban mansions. 5) My research paper explored how all the technical elements of moving image such as light, editing and sound can work together to represent on screen the inner world of a character. I looked at three films: ‘Lost Highway’ by David Lynch, ‘Stalker’ by Andrei Tarkovsky and ‘Last Year in Marienbad’ by Alain Resnais. 6) Outside of mainstream cinema, experimental film-makers take this visual exploration of the human psyche to extremes. The Ukrainian film ‘Las Meninas’ tells the story of the dysfunctional family and the claustrophobic atmosphere of the house and unnerving sound design mirror the characters’ neuroses. 7) Video artist Markus Schinwald shows strange, stoic looking characters wandering aimlessly though a drab, dark hotel. The characters perform odd, seemingly pointless actions and seem utterly lost in the labyrinth of the hotel. The video gives a strong feeling of alienation. 8 ) In ‘Talo’ (The House), Eija-Liisa Ahtila shows a woman suffering from psychosis wandering inside her house. The visuals and sound design reproduce the altered spatio-temporal perception and auditory hallucinations experienced by psychosis patients. This work was based upon discussions with psychosis patients who had overcome their illness, and Ahtila attempts to audio-visually reproduce their experience. 9) In the past month, I furthered this research in a more practical direction by reading cinematography and editing reference books to learn more tricks and try to make my video art more sophisticated. I’m particularly interested in triggers to manipulate the audience’s feelings and reactions. 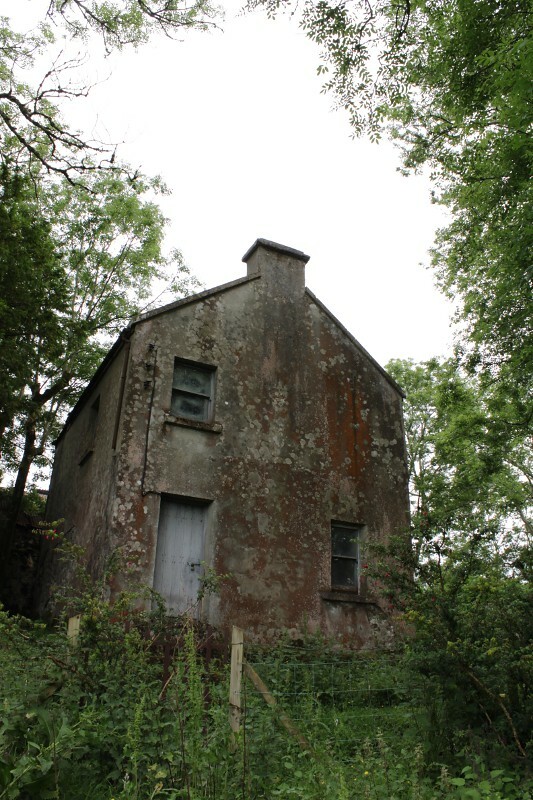 10) I have a long standing project of documenting ‘Ghost houses’, vernacular houses in Ireland left abandoned when their owners died or emigrated. The owner either had no family, or the heirs had no interest in a small old-fashioned house in the middle of nowhere. 11) The ‘Ghost Houses’ interest me as social documents. 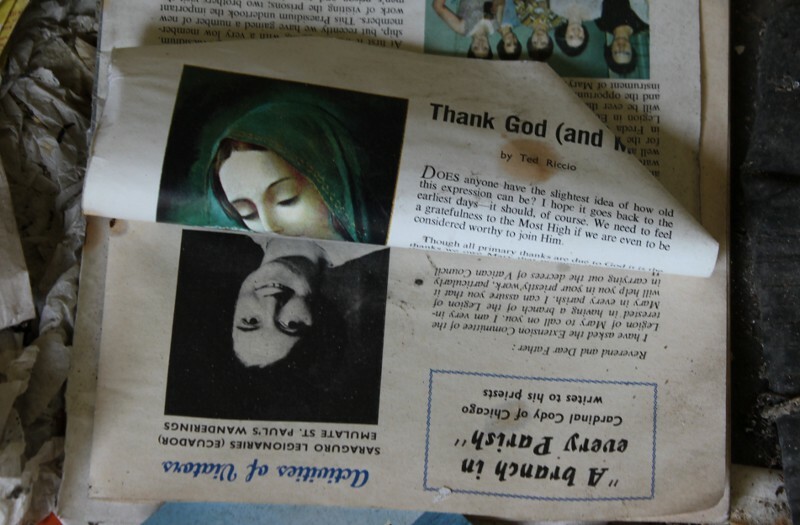 The objects in them reflect the power of the Catholic Church in Ireland, and a long history of poverty and hardships. 12) The Ghost Houses are also fascinating as purely aesthetic subjects. The play of light and shadows in them is often beautifully eerie and uncanny juxtaposition of objects are often to be found. 13) Michel Foucault defines ‘Disciplinary Institutions’ as places where people are made useful and obedient through the repression of any deviation from the norm. 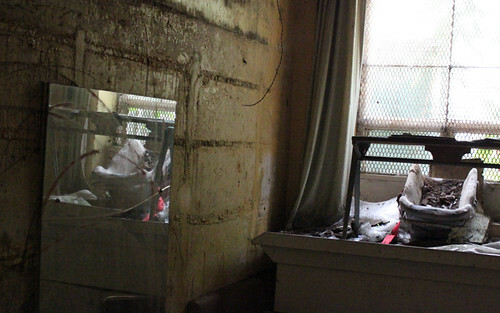 I documented such places in Ireland, where access to derelict buildings is easier. 14) Magdalene laundries were used to imprison women who were judged in danger of being promiscuous, or not docile enough by their family. 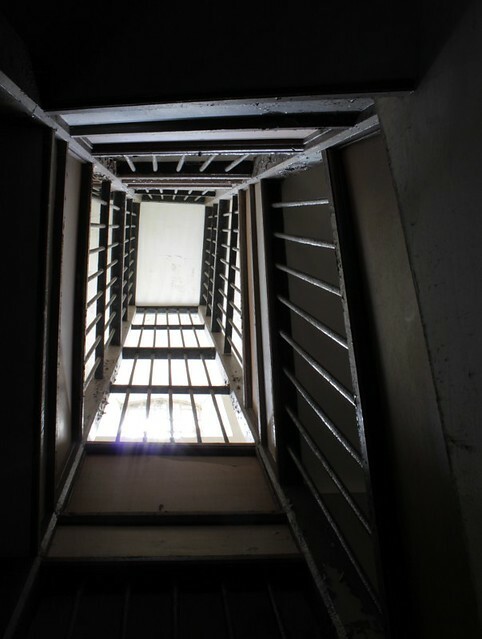 Many mentally disabled women were also imprisoned. 15) Insane asylums had long been used to get rid of people judged eccentrics. Husbands also sent their wives there to get rid of them when divorce was not allowed. 16) Workhouses were used to imprisoned poor people in Ireland and the UK. They were made to work for free when they found themselves unable to earn a living (for example when they lost tenancy on their farm). 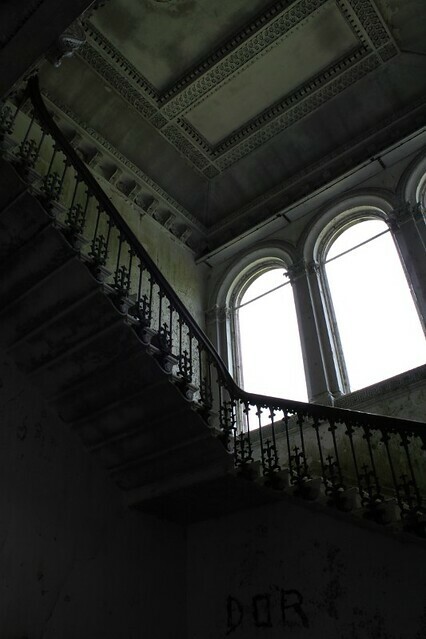 17) I photographed Woodlawn House, a derelict mansion in Ireland. In the video, I tried to replicate the formally composed long travelling shots from ‘Last year in Marienbad’ because the majestic decor reminded me of the Marienbad Palace if left abandoned. 18) I took pictures of kitsch in my childhood village in search of uncanny juxtapositions, inspired both by the Surrealists and the photographers of backwards America. 19) I took pictures of Raw Art Environment because they physically represent the way people reinvent their surroundings to match their psyche. What photographers and experimental film-maker do metaphorically in their images, marginalised Raw Artists do literally in their home. 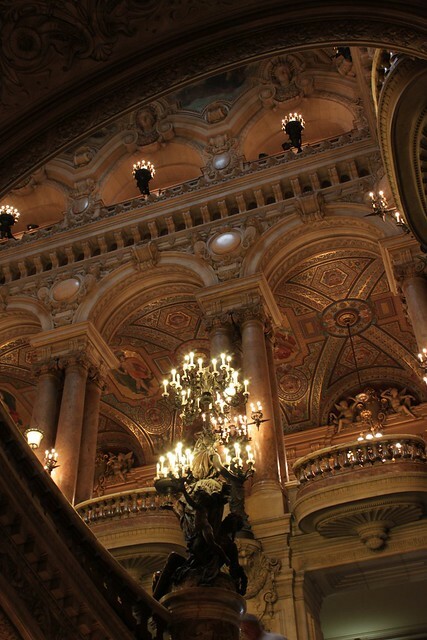 20) The last practical work I did was to take pictures and videos in the Opera Garnier in Paris to experiment with the visual possibilities offered by very ornamented décors, inspired by Alain Resnais’ film ‘Last year in Marienbad’ and Robert Polidori’s photographs of Versailles.